Despite the feminist revolution of the past twenty years, most women in America are worse off today than at any time in the recent past. Magazines and television programs profile women bank executives, surgeons, and corporate lawyers, but the vast majority of women still work in relatively low-paying jobs. Women work more hours per week in the house and outside than ever before, and a paying job has become a necessity for women in most households. What went wrong? 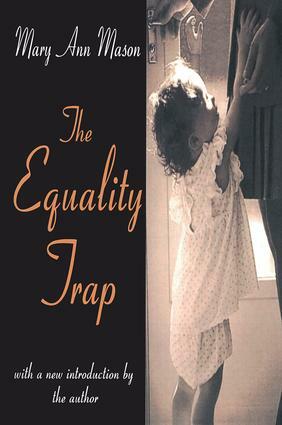 In this provocative book, Mary Ann Mason argues that the women's movement shares some of the blame for this situation. In an original analysis that draws on both social and legal history, she explains how the move away from women's rights toward equal rights has worsened the situation of American working women, especially working mothers. Because women are still the primary care-providers for their children, they must take flexible and relatively low-paying jobs to be available in case of a child-care problem. With nearly 50 percent of all marriages now ending in divorce, and with a growing trend-inspired by the equal rights movement-toward no-fault divorce and low- or no-alimony settlements, divorced mothers frequently find themselves economically devastated. Mary Ann Mason argues that the solution to this predicament is to draw up a new women's rights agenda that will benefit all working women, especially those with children. The equal-rights strategy was important in opening the door for the highly publicized super-achievers, but it is now time, she says, to improve the lives of the majority of America's working women. This book will be of interest to readers interested in gender studies, and particularly issues of equality and feminism. Mary Ann Mason is a professor of law and social welfare at the University of California, Berkeley. In addition to her law degree, Mason holds a Ph.D. in American social history.